Liczba stron: 126 Jest to ujednolicona liczba stron, która ułatwi Ci porównanie długości książek. Każda strona Legimi to 200 słów. 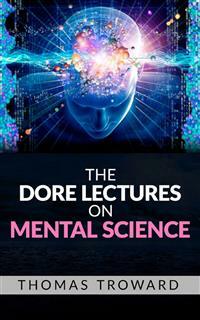 The Dore Lectures on Mental Science are required reading for anyone wishing to understand and control the power of the mind. Without these lectures the New Thought Movement and The Science of Mind might never have been born. Thomas Troward was an early New Thought writer who had an immense impact on those who would follow. Ernest Holmes, Frederick Bailes, Joseph Murphy, and Emmett Fox cited him as a major influence, and Genevieve Behrend was his student. It is impossible to over estimate his importance to the New Thought movement. His intense fusion of Eastern and Western philosophy is unmatched. The addresses contained in this volume were delivered by me at the Dore Gallery, Bond Street, London, on the Sundays of the first three months of the present year, and are now published at the kind request of many of my hearers, hence their title of "The Dore Lectures." A number of separate discourses on a variety of subjects necessarily labours under the disadvantage of want of continuity, and also under that of a liability to the frequent repetition of similar ideas and expressions, and the reader will, I trust, pardon these defects as inherent in the circumstances of the work. At the same time it will be found that, although not specially so designed, there is a certain progressive development of thought through the dozen lectures which compose this volume, the reason for which is that they all aim at expressing the same fundamental idea, namely that, though the laws of the universe can never be broken, they can be made to work under special conditions which will produce results that could not be produced under the conditions spontaneously provided by nature. This is a simple scientific principle and it shows us the place which is occupied by the personal factor, that, namely, of an intelligence which sees beyond the present limited manifestation of the Law into its real essence, and which thus constitutes the instrumentality by which the infinite possibilities of the Law can be evoked into forms of power, usefulness, and beauty. The more perfect, therefore, the working of the personal factor, the greater will be the results developed from the Universal Law; and hence our lines of study should be two-fold—on the one hand the theoretical study of the action of Universal Law, and on the other the practical fitting of ourselves to make use of it; and if the present volume should assist any reader in this two-fold quest, it will have answered its purpose. The different subjects have necessarily been treated very briefly, and the addresses can only be considered as suggestions for lines of thought which the reader will be able to work out for himself, and he must therefore not expect that careful elaboration of detail which I would gladly have bestowed had I been writing on one of these subjects exclusively. This little book must be taken only for what it is, the record of somewhat fragmentary talks with a very indulgent audience, to whom I gratefully dedicate the volume. We all know the meaning of this phrase in our everyday life. The Spirit is that which gives life and movement to anything, in fact it is that which causes it to exist at all. The thought of the author, the impression of the painter, the feeling of the musician, is that without which their works could never have come into being, and so it is only as we enter into the IDEA which gives rise to the work, that we can derive all the enjoyment and benefit from it which it is able to bestow. If we cannot enter into the Spirit of it, the book, the picture, the music, are meaningless to us: to appreciate them we must share the mental attitude of their creator. This is a universal principle; if we do not enter into the Spirit of a thing, it is dead so far as we are concerned; but if we do enter into it we reproduce in ourselves the same quality of life which called that thing into existence. Now if this is a general principle, why can we not carry it to a higher range of things? Why not to the highest point of all? May we not enter into the originating Spirit of Life itself, and so reproduce it in ourselves as a perennial spring of livingness? This, surely, is a question worthy of our careful consideration. Now this is the Spirit that we need to enter into, and the method of doing so is a perfectly logical one. It is the same method by which all scientific advance is made. It consists in first observing how a certain law works under the conditions spontaneously provided by nature, next in carefully considering what principle this spontaneous working indicates, and lastly deducing from this how the same principle would act under specially selected conditions, not spontaneously provided by nature. INDIVIDUAL PERSONALITY the Spirit can only work cosmically by a GENERIC Law; but this law admits of far higher specialization, and this specialization can only be attained through the introduction of the personal factor. But to introduce this factor the individual must be fully aware of the PRINCIPLE which underlies the spontaneous or cosmic action of the law. Where, then, will he find this principle of Life? Certainly not by contemplating Death. In order to get a principle to work in the way we require it to, we must observe its action when it is working spontaneously in this particular direction. We must ask why it goes in the right direction as far as it does—and having learnt this we shall then be able to make it go further. The law of floatation was not discovered by contemplating the sinking of things, but by contemplating the floating of things which floated naturally, and then intelligently asking why they did so. The knowledge of a principle is to be gained by the study of its affirmative action; when we understand THAT we are in a position to correct the negative conditions which tend to prevent that action. Now Death is the absence of Life, and disease is the absence of health, so to enter into the Spirit of Life we require to contemplate it, where it is to be found, and not where it is not- -we are met with the old question, "Why seek ye the living among the dead?" This is why we start our studies by considering the cosmic creation, for it is there that we find the Life Spirit working through untold ages, not merely as deathless energy, but with a perpetual advance into higher degrees of Life. If we could only so enter into the Spirit as to make it personally IN OURSELVES what it evidently is in ITSELF, the magnum opus would be accomplished. This means realizing our life as drawn direct from the Originating Spirit; and if we now understand that the Thought or Imagination of the Spirit is the great reality of Being, and that all material facts are only correspondences, then it logically follows that what we have to do is to maintain our individual place in the Thought of the Parent Mind. We have seen that the action of the Originating Mind must needs be GENERIC, that is according to types which include multitudes of individuals. This type is the reflection of the Creative Mind at the level of that particular GENIUS; and at the human level it is Man, not as associated with particular circumstances, but as existing in the absolute ideal. In proportion then as we learn to dissociate our conception of ourselves from particular circumstances, and to rest upon our ABSOLUTE nature, as reflections of the Divine ideal, we, in our turn, reflect back into the Divine Imagination its original conception of itself as expressed in generic or typical Man, and so by a natural law of cause and effect, the individual who realizes this mental attitude enters permanently into the Spirit of Life, and it becomes a perennial fountain of Life springing up spontaneously within him. He then finds himself to be as the Bible says, "the image and likeness of God." He has reached the level at which he affords a new starting point for the creative process, and the Spirit, finding a personal centre in him, begins its work de nova, having thus solved the great problem of how to enable the Universal to act directly upon the plane of the Particular. It is in this sense, as affording the requisite centre for a new departure of the creative Spirit, that man is said to be a "microcosm," or universe in miniature; and this is also what is meant by the esoteric doctrine of the Octave, of which I may be able to speak more fully on some other occasion. If the principles here stated are carefully considered, they will be found to throw light on much that would otherwise be obscure, and they will also afford the key to the succeeding essays. The reader is therefore asked to think them out carefully for himself, and to note their connection with the subject of the next article.